These days no awards ceremony (and they are plentiful) seems to be complete without a 'Lifetime Achievement Award'. Among the still active grandfathers, godfathers of French cuisine, the famous Paul Bocuse (86) is no doubt the doyen, but the name of legendary French chef Michel Guérard (81) seems surprisingly overlooked. Guérard is a man who has devoted his life to his profession like few others have, and notwithstanding his age he is by no means a "vieux monsieur". "Au contraire, mon ami": this sprightly, energetic "Petit Prince's" stars are still shining bright. He started his career at the early age of 14, as an apprentice at the patisserie of Kleber Alix in Normandy. Later on, after military service, he continued his training at famous Parisian restaurants such as fifties celebrity hotspot Maxim's and the restaurants at the iconic Paris hotels Le Meurice and Hôtel de Crillon. 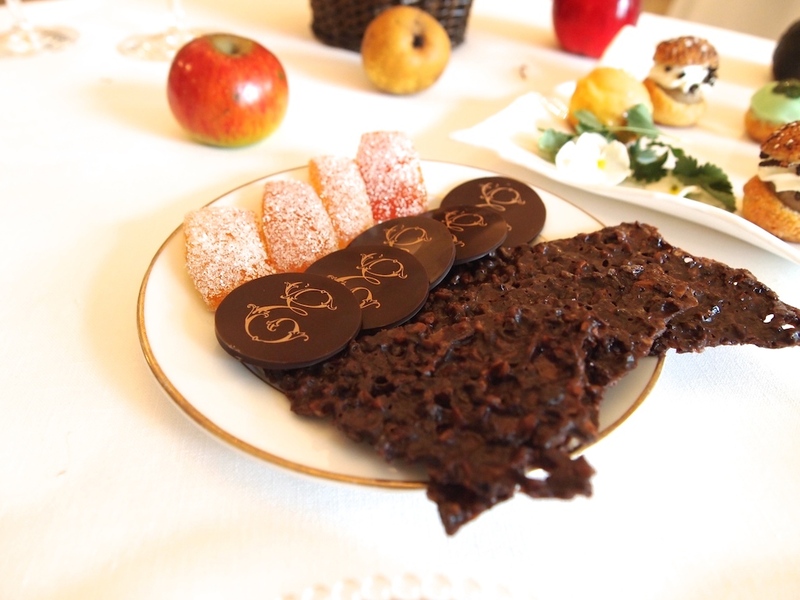 In 1958, whilst working as a pastry chef at Hôtel de Crillon, Michel Guérard became 'Meilleur Ouvrier de France' in the patisserie category. After his sojourn at the Crillon, Guérard joined Le Lido in Paris, where he remained until he opened his own restaurant "Le Pot-au-Feu" in Paris in 1965. 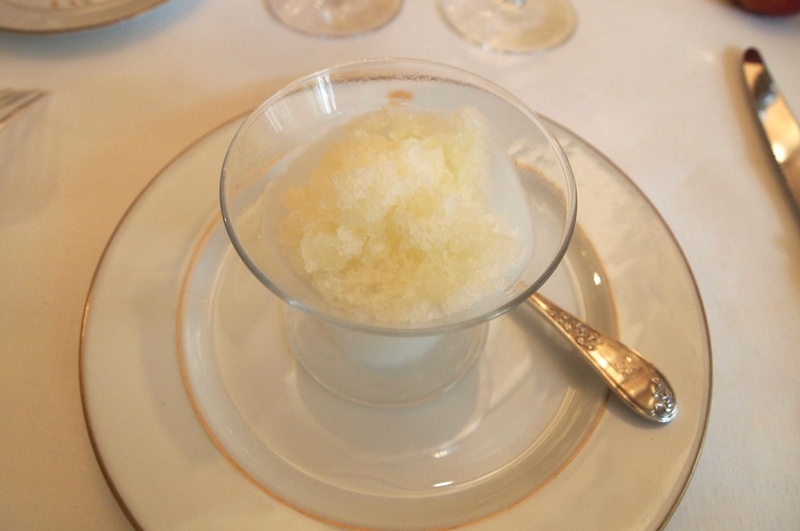 It was at Le Pot-au-Feu where he earned his first two Michelin stars, the first in 1967 and the second in 1971. The next year Michel Guérard met his future wife Christine, the daughter of Biotherm founder Adrian Barthelemy, who also owned a chain of French spa hotels. 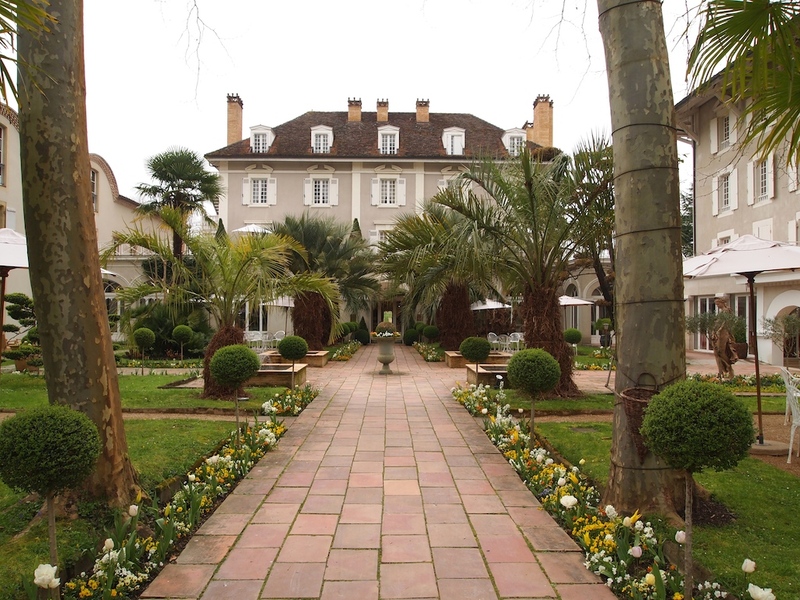 One of Barthelemy's properties was in Eugénie-les-Bains, and it was here where Guérard and his wife established Les Prés d'Eugenie, a hotel-restaurant that eventually became world-famous for its 'Cuisine Minceur', and that has held three Michelin stars since 1977. 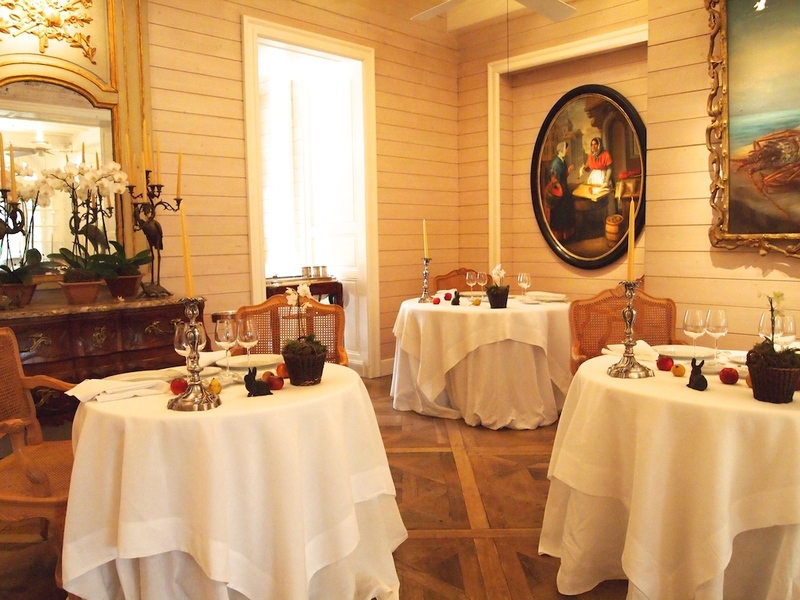 From September to May Michel Guérard is open for dinner Tuesday till Sunday and for lunch on Saturdays and Sundays. In July and August the restaurant is open daily for lunch and dinner. Apart from the a la carte menu, and a special 600-calorie Menu Minceur, there are three tasting menus on offer: École Buissonnière (3 courses + dessert for €175), Jour de Fête (3 courses + dessert for €195) and Palais Enchanté (4 courses + dessert for €215). 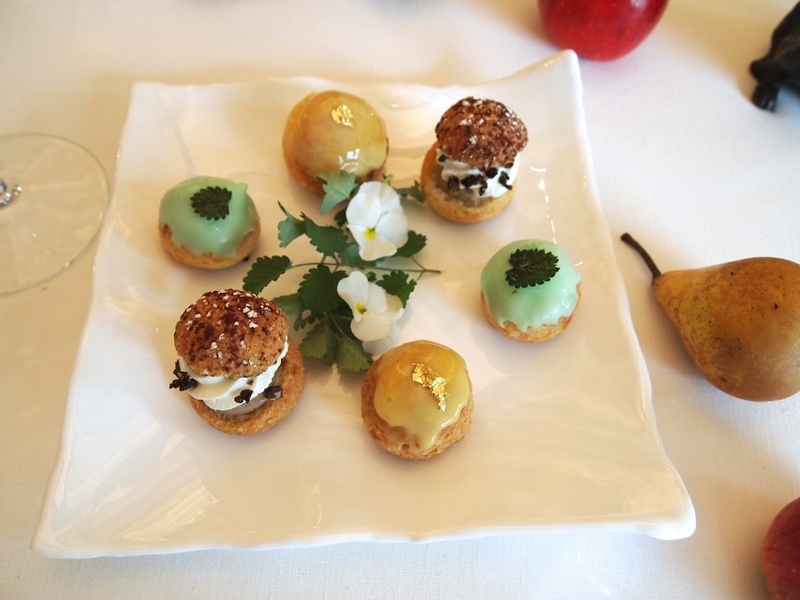 I had lunch with my husband at Michel Guérard on Sunday 30 March 2014 and we both had the Palais Enchanté menu. Lunch started with three excellent appetizers. 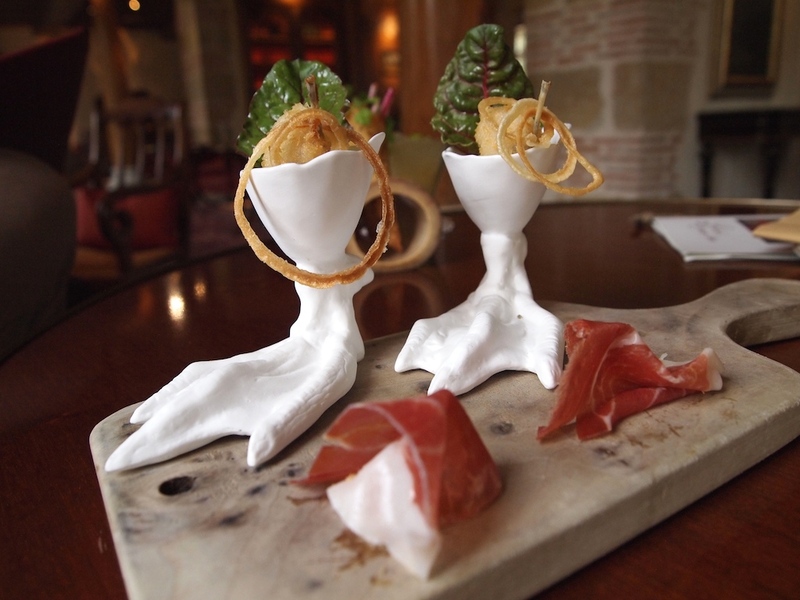 There was a nice and juicy frog's leg beignet, served with crispy onion rings and an avocado créme, some very tasty Noir de Bigorre ham and a cornetto filled with a light petit pois mousse and some julienne-cut truffle and beetroot. 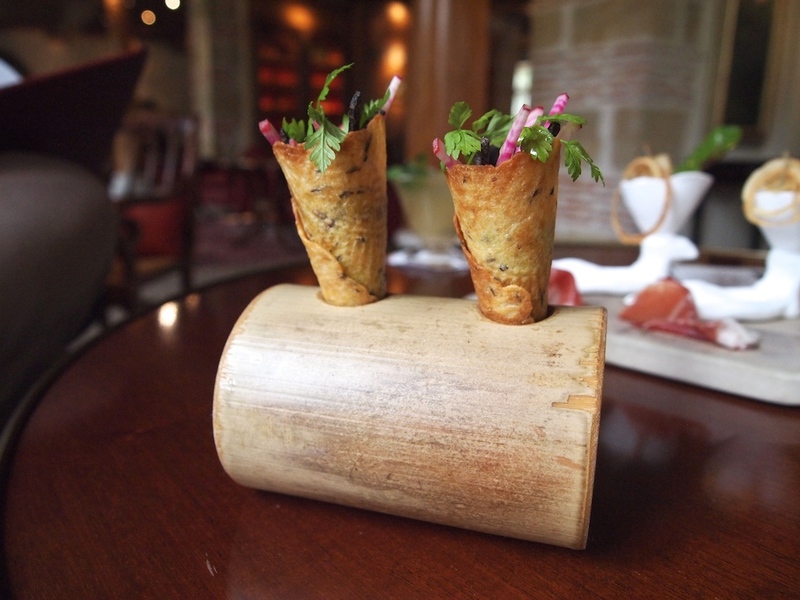 The cornetto had a lovely hint of cumin, making it much more than just a serving vessel. 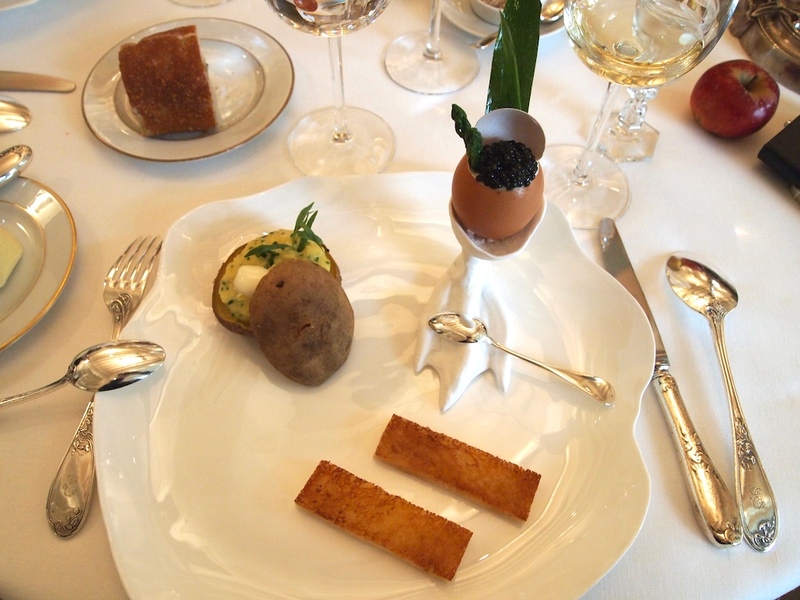 Almost every great French chef has a signature dish which involves an egg. Accordingly, the first course of my tasting menu was Michel Guérard's 'L'Oeuf Poule au Caviar à la Coque', a celebration of chicken and sturgeon eggs. 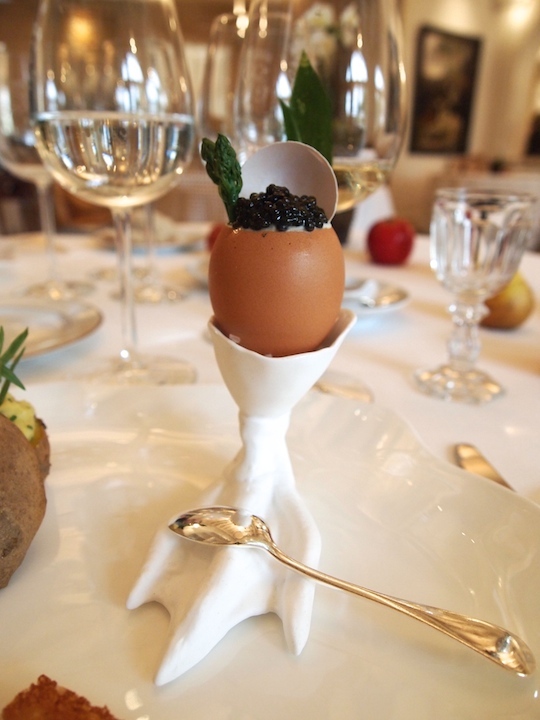 On the English menu it was described as 'Tsarina egg with Caviar'. At the bottom of the eggshell there is a smoked eel jelly, followed by a set vegetable cream, a spoonful of caviar and garnished with a green asparagus tip. A delightful combination and both the eel jelly and vegetable cream had set perfectly. 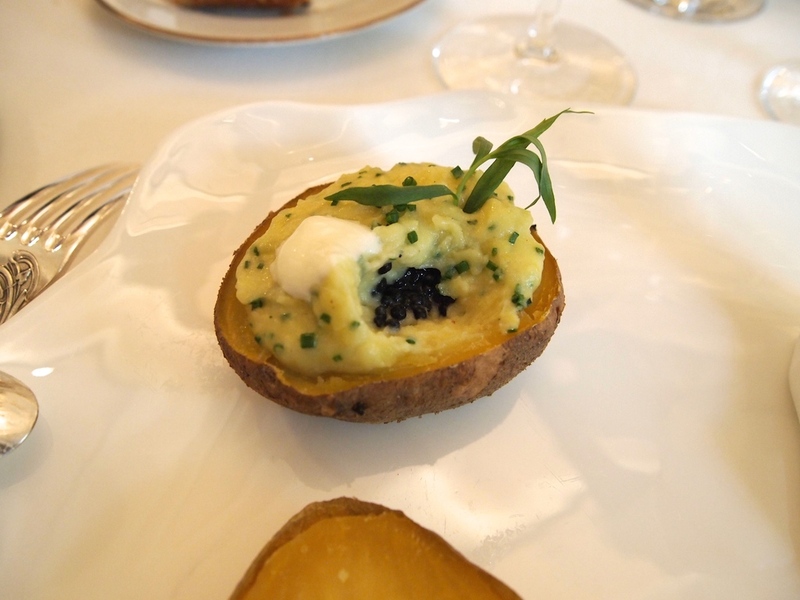 To accompany this gorgeousness there was a 'Chaud-froid' of potato: a wonderfully light (as in: not too buttery) potato and chive mousseline with a caviar centre, topped with an elegant herring cream. A glass of fiery yet smooth Blanc Armagnac was served on the side. 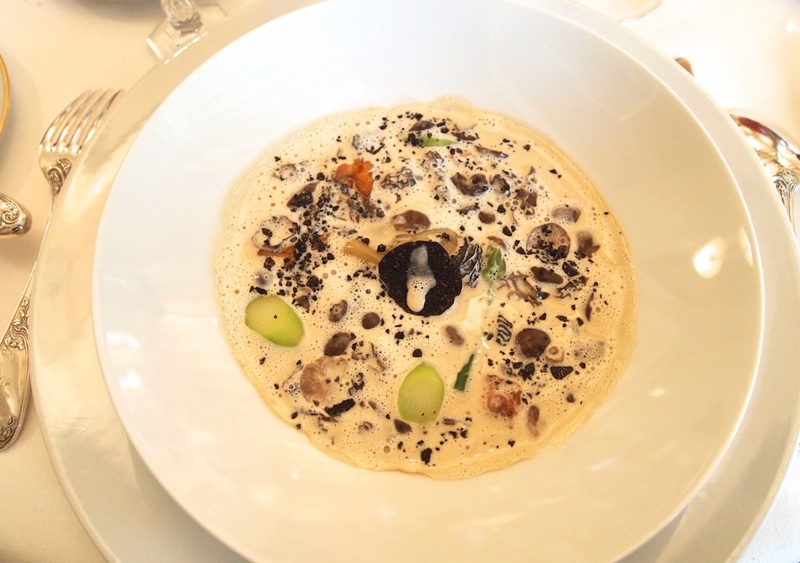 Second course was a dish called 'L'Oreiller Moelleux de Mousserons et de Morilles au Fumet de Truffe' (Soft pillow of morels and wild mushrooms in truffle sauce). This dish has been on the menu since 1976 (!). The pillow referres to a mousseron mushroom ravioli, which was served in a creamy truffle sauce (to be eaten as a soup), speckled with fresh mushrooms, softened dried mushrooms and a few pieces of green asparagus for freshness. The combination of fresh and dried mushrooms delivered wonderful flavour sensations. First you get the juicy, mildly sweet flavours from the fresh mushrooms (including a touch of toastiness from the girolles), followed by the earthy and meaty dried mushrooms, the latter also adding a nice umami kick to the dish. The creamy truffle sauce had been reduced to perfection, resulting in an elegant caramel finish. A rich but incredibly refined dish with beautifully layered flavours. 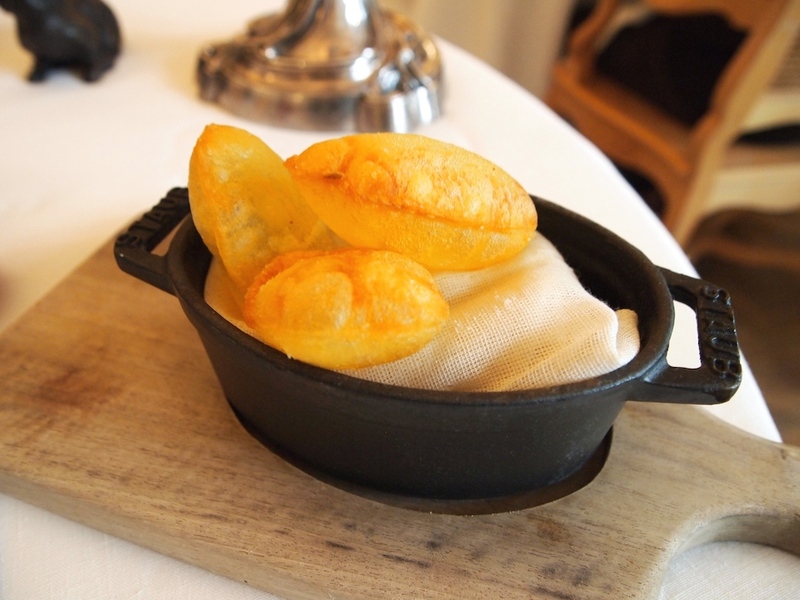 This was followed by lightly smoked lobster served with a saffron butter sauce and a roasted 'au gratin' onion filled with a smooth onion and peach puree. 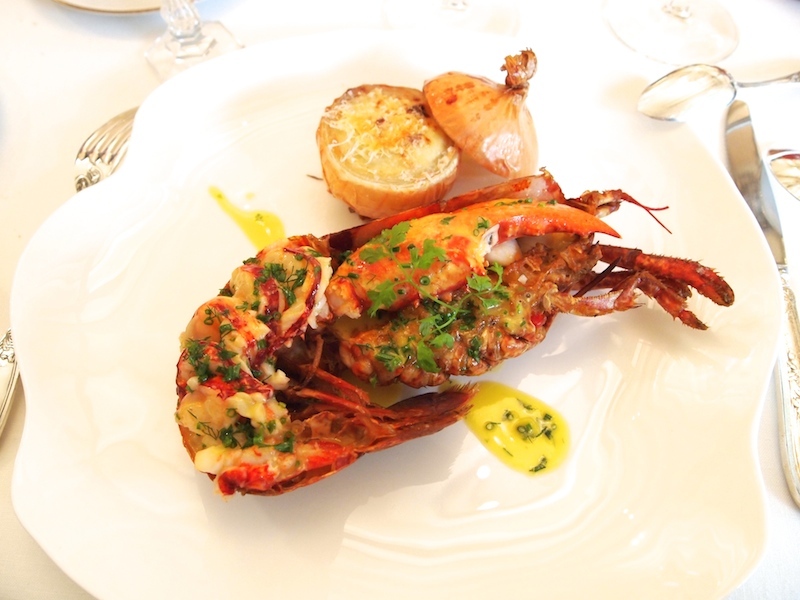 Top-quality lobster, briefly roasted in an open fire place, resulting in wonderful succulent meat with a hint of smokiness. The onion and peach puree was extraordinary. Beautiful velvety texture, creating the impression of creaminess, and perfectly balanced sweet and fruity flavours. Both the lobster and onion-peach puree were marvellous on their own, but the combination of the two was truly dazzling. The main course was 'Wood Fired Beef'. 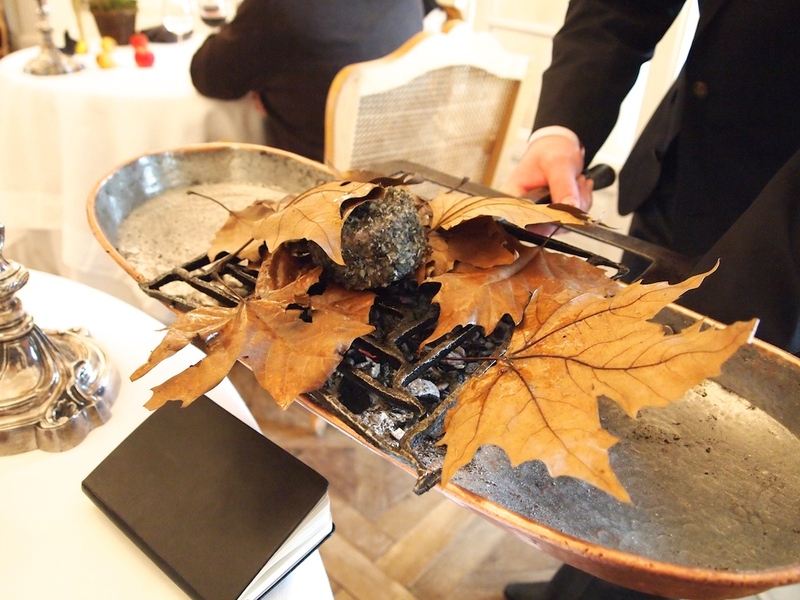 First the beef was presented tableside in its charcoal tray, and then taken back to the kitchen for carving and plating. The end result was incredibly tender and juicy beef, with a breadcrumb and squid ink crust (to resemble charcoal). In all the excitement I forgot to ask which beef they use (but I am assuming it is Blonde d'Aquitaine - what else?). The beef was served with some dark-red shallots, braised in red wine and beetroot juice, creamy and smooth potato mash, a syrupy reduction of the beef and onion cooking juices and light and crispy potato soufflés. The beauty of this dish was in the eating; the beef was of spectacular quality, the flavours were bang-on and it certainly showed consummate skill in the art of cooking beef. Dessert was 'La Pêche "Miss Dior" en Melba Exquise'. The juiciest of peaches (poached and then preserved in a vanilla flavoured syrup) served with the freshest and purest raspberry coulis imaginable. Also on the plate were some mini quenelles of herb sorbet, beautifully flavoured with mint, coriander, parsley, basil and tarragon. Underneath the coulis was some vanilla ice cream. A fabulous take on the classic Peach Melba, that had the perfect level of sweetness. 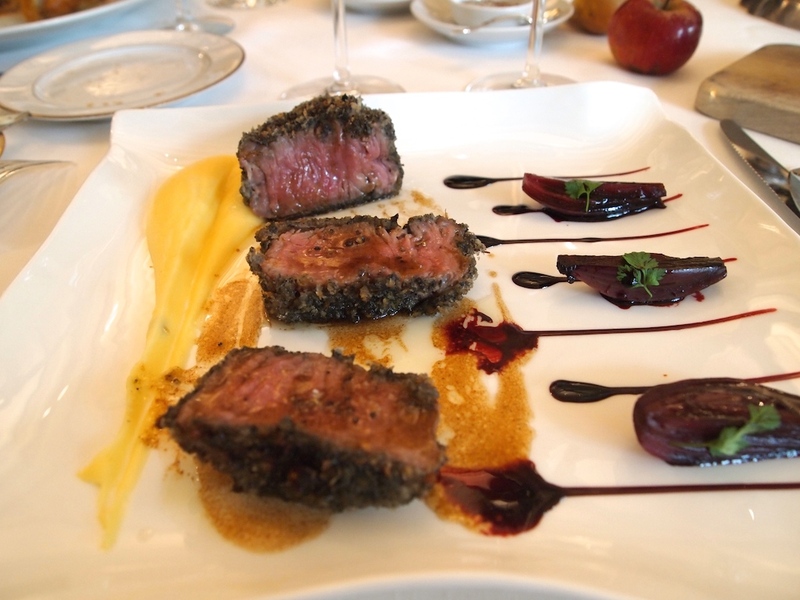 La Grande Cuisine is the heart and soul of French culinary tradition. When Michel Guérard was born, Auguste Escoffier was still alive and Guérard was already 21 years old when Fernand Point died in 1955. Guérard was one of the driving forces behind 'Nouvelle Cuisine' in the 1970's and there is nothing staid, static or old-fashioned about his cuisine today. I enjoyed unique dishes that have stood the test of time, and that had the same impact on me as they have had on generations of diners before me. This is brilliantly executed food, but the cooking techniques are actually quite straightforward: no smoke, snow and mirrors here. I was deeply impressed (and sometimes moved) by this immortal cuisine, supremely elegant but high on impact and flavour, by this unsurpassed display of craftsmanship and immense competence. 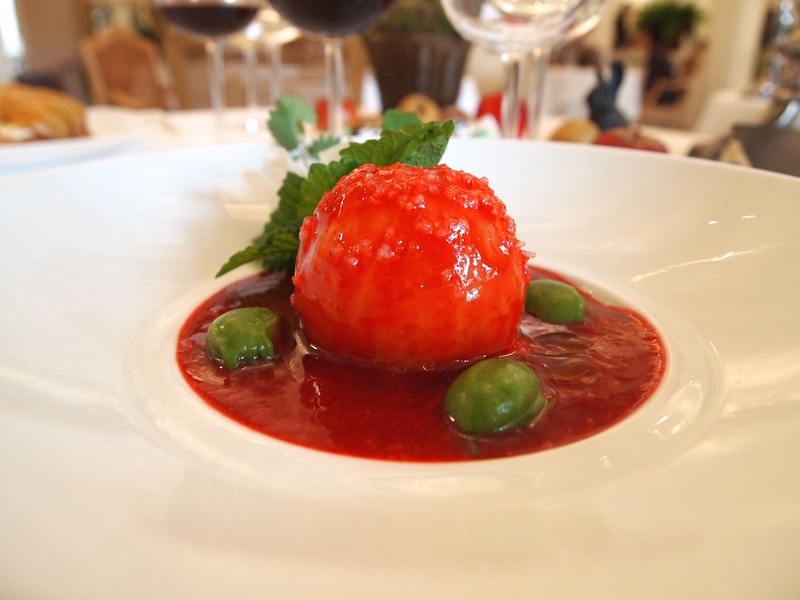 Michel Guérard is a grand master of French gastronomy and his food displays the seemingly effortless brilliance and ease that only very few achieve. Beauty is eternal.